What is a Lone Soldier? A Lone Soldier is an immigrant or volunteer who serves in the Israeli Defense Forces without having immediate family with him or her in Israel. How many Lone Soldiers are in the Israeli Defense Forces? There are more than 6,000 Lone Soldiers serving in the Israeli Defense Forces. From where do Lone Soldiers come? Lone Soldiers come from around the world to serve in the Israeli army. What units do Lone Soldiers join? Lone Soldiers join all units of the IDF. Around 30% serve in combat units and about 20% serve in combat-support units. Where do Lone Soldiers live? Lone Soldiers often live together in apartments or on kibbutzim throughout the country. Typical army service for Israelis is three years for males, two years for females. Lone Soldiers often vary their years of service. Where do they go after they serve? Many Lone Soldiers return to their home countries after serving in the army. Some remain in Israel. Are there Lone Soldiers from within Israel? Yes. Approximately 40% of the Lone Soldiers are Israeli - orphans, youth from broken homes or very low socio-economic backgrounds. They also lack familial support while in the army. Do Lone Soldiers receive support from the Israeli government? Lone Soldiers do receive a stipend but it is often not enough for toiletries, clothing, food, and other necessities they need while serving, in addition to their monthly rent. What do Lone Soldiers do after the army? Soldiers have a very difficult transition from army to civilian life. Many Lone Soldiers who come from abroad have an extremely difficult time finding employment and as such often return to their home for financial reasons, despite wishing to start their lives in Israel. Soldiers that do stay pursue education or vocational training or begin working. We want to support soldiers. Is it better for us to collect items or donations? Either option is greatly appreciated by the Lone Soldiers. Collecting donations requires less time and will reach the Soldiers more quickly. Collecting items entails a shipping cost or coordination with a local mission to bring the goods. The items of greatest need change based on position in training and army service. Neck warmers, socks, helmet flashlights, energy bars and fleece jackets are always needed. We have circulated surveys to current Lone Soldiers asking what they need most at various milestones in their IDF careers. We have also held conversations with former Lone Soldiers to learn what would have been of greatest assistance while serving in the army. How will our items be sent to Israel? Items can be shipped to Israel or delivered through a local organization’s trip to Israel. 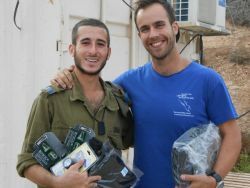 Community members traveling on Birthright or any mission can bring a suitcase of items with them to Israel. Staff from The Lone Soldier Project™ will meet these individuals to collect the items. Who will distribute them to the soldiers? The Lone Soldier Project™ will distribute items to the soldiers, beginning with those who have greatest needs and most limited government funding. If I give a donation, can I designate what it will support? Why do Lone Soldiers need backpacks if they already receive bags from the army? The army provides soldiers with two bags, both of which are meant to be kept on base to store one's equipment. The army provides one large green duffle bag to hold items used for daily life, such as clothes, sleeping bag, cold weather gear, shoes, and uniforms) and one old-school WWII style-bag to hold army-related items, such as a protective jacket, knee pads, vest, and gas mask, extra magazines. There is a big ceremony in Israel when parents take their kids to buy their army watch and backpack. The backpack is needed in particular to take clothes to and from base (so they can get cleaned, as there is no laundry on base), and so hands can be available, as your going to and from base with your gun. Since Lone Soldiers do not have their parents with them in Israel, they aren't able to participate fully in this ceremony. Some Lone Soldiers do bring backpacks with them, which they use during their army service, or can afford to go out and spend ~$100 to purchase an appropriate backpack. However, several do not bring one with them nor do they have the means to make the purchase. I am traveling to Israel. Can I meet a Lone Soldier? Yes, contact us to learn how to meet a Lone Soldier while in Israel. I am a Birthright organizer and would like my participants to meet with a Lone Soldier. Can you help? Yes, contact us and we will be happy to work with you to arrange a visit. I want to host an event to support Lone Soldiers. How can I get a former Lone Soldier to speak at my event? Click here to let us know you are hosting an event and we will coordinate with Lone Soldiers in your area. Yes, you can donate directly to The Lone Soldier Project™ by clicking here. How can we utilize community resources to collect items? Think creatively about your community members and what each person has to offer. If you know a dentist, ask if he or she is willing to donate samples of toothbrushes and toothpaste. If someone is connected to a food company or grocery store, suggest a donation of granola bars for the soldiers. If you have relatives in Israel, tell them about the Lone Soldier Center and recommend that they host a Shabbat dinner or attend a beret ceremony to show support. Can we show support without spending money? Yes. We encourage you to send letters or emails to Lone Soldiers. Having your group sign posters for the Soldiers to hang in their barracks is another suggested option. Your website says you work with the Lone Soldier Center in Memory of Michael Levin. The Lone Soldier Center in Memory of Michael Levin was founded in 2009 by a group of former Lone Soldiers aware of and concerned with the needs and struggles of the Lone Soldiers serving in the IDF. The Lone Soldier Center is dedicated to meeting all of the physical and social needs of lone soldiers and has a volunteer staff, many of whom were Lone Soldier themselves and understand the needs of Lone Soldiers before, during, and after their service. What does the Lone Soldier Center provide? direct 1-on-1 counseling throughout a soldier's service, furniture collections and deliveries, and support during milestones such as beret ceremonies, end of training ceremonies, and draft days. Visit their website to learn more.